Dr Cathal Doyle, Research Fellow in Business, Labour and Society in Transition at Middlesex University, visits New York this week to launch his new book on the rights of indigenous people. 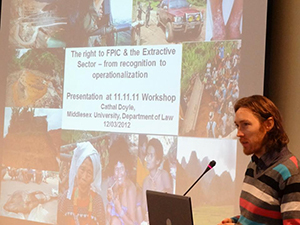 In Indigenous Peoples and the Extractive Sector: Towards a Rights Respecting Engagement, Dr Doyle examines the problems and challenges posed to indigenous communities by the extractive sector (the mining, quarrying, dredging, oil and gas extraction industries). He argues that in many instances the sector has been responsible for the destruction of their territories, the undermining of their structures of governance and the loss of their traditional livelihoods. This, he emphasises, has had devastating effects on indigenous people's self-determination, territorial and cultural rights. Dr Doyle explained: "Despite significant developments in international law, a growing number of extractive industry projects will impact on indigenous peoples' enjoyment of their rights unless concrete measures are taken to give effect to the UN Declaration on the Rights of Indigenous Peoples. "I hope this book will contribute to the implementation of the necessary framework for a genuine rights-based engagement with indigenous peoples. "It is crucial that we continue to work towards an indigenous-rights compliant extractive sector which is governed consistently with the principle of sustainable development." Dr Doyle launches his book today (24 September) at the Ford Foundation, an independent, global organisation which supports innovative leaders and organisations on the frontlines of social change. The book is a joint publication of Tebtebba (a Philippines-based Indigenous Peoples' International Centre for Policy Research and Education), Indigenous Peoples Links (PIPLinks - a London-based NGO), and Middlesex University Business School with the support of Tamalpais Trust. It is co-authored with Andy Whitmore of PIPLinks.